According to the "Jane's Missiles & Rockets" magazine in James Bingham's article "Novator reveals new Club system, missile and range details", at the international defense and space exhibition Gulf Defense & Aerospace held in Kuwait in December 2017, the Russian JSC "Experienced Design Bureau" Innovator "named after L.V. Lyuliev "(Ekaterinburg, part of the JSC" Concern VKO Almaz-Antey ") for the first time introduced a new ground-based mobile version of its Club missile system (export version of the Caliber complex), designated Club-T. Unlike the first shown on the air show MAKS-2007 of the similar ground mobile complex Club-M (equipped with anti-ship missiles of types 3М54КЭ and 3М54КЭ1 and cruise missiles 3М14КЭ), the Club-T complex in the current version is intended only for the use of modified cruise missiles for the destruction of ground targets 3М14Э1 . Accordingly, the target designation means with the corresponding machine were removed from the complex, and only self-propelled launchers on the MZKT-7930 chassis with the wheel formula 8x8 are left, on each of which six transport-launch containers with cruise missiles 3M14E1 are placed. What exactly is the cruise missile version of the 3M14E1 differs from the previously demonstrated 3M14E / KE rocket, is not disclosed. Although officially, the Novator OKB Novator declares the range of the 3M14E1 missile at 275 km, but Mikhail Pakhomov, the head of the Novator's foreign relations department, confirmed at the exhibition in Kuwait that the range can be increased to more than 300 km that will exceed the limits of the Missile technologies (MTCR). The mass of the missile's warhead in accordance with the MTCR limits is declared at 450 kg. It is reported that the launch of cruise missiles from the Club-T launcher can be carried out within 15 minutes of deployment, launching the missiles at intervals of 5-10 seconds. 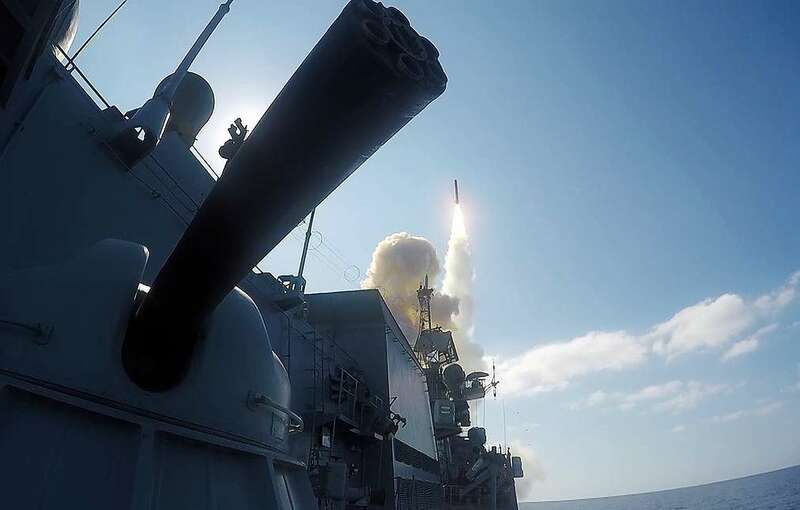 Pakhomov said that they are close to completing the integration of the anti-ship missiles 3M54E and 3M54E1 into the Club-T complex (as you can understand, their application is supposed to be based on external target designation data). Also, the Novator Design Bureau at the exhibition in Kuwait presented materials on the new version of the 3M14E sea-launched cruise missile designated 3M14TLE intended for underwater launching from vertical submarine launchers (the Club-S system). The bmpd comment. Presumably, the self-propelled launchers of the Club-T complex are analogous to the most alleged US attacks on allegedly "extended" launchers of the Iskander-M version of the complex with the notorious 9M729 cruise missiles, according to the American side allegedly violating the terms of the Treaty on the Elimination of Missiles average and shorter range of 1987. I imagine that is exactly what Russia will field if US decides to scrap INF treaty. 6 ready to fire cruise missiles with 1,500 - 2,500km range? Now if they can make the missiles supersonic, even better. miketheterrible wrote: I imagine that is exactly what Russia will field if US decides to scrap INF treaty. 6 ready to fire cruise missiles with 1,500 - 2,500km range? Now if they can make the missiles supersonic, even better. If INF gets scrapped Iskander will be getting extra first stage so that will cover supersonic segment. This here is logical evolution of Kalibr. I wonder why they didn't just go with 4 or 6 per truck from the start but oh well, at least it's coming now. 2 missiles were enough to make ships stay far from the country specially if they are amphibious non armed vessels. This is clearly for land attack capabilities and salvo attacks. From what I have read the export model of this vehicle has a weapon range of 270km and a warhead of less than 450kgs which means well within export limits on missiles for export. This offers the basis however of a very effective system for the Russian Army where the domestic model could carry up to 500km range missiles with no limit on the warhead. While the INF treaty exists its range is limited so fit it with a couple of 400kg payloads it can drop along its flight path... out to 500km. When the INF treaty is gone it can be upgraded to higher speed and much greater ranges.... in fact with a decent solid rocket booster and a highly efficient jet engine and new modern fuel and of course a small light nuclear warhead its flight range could easily exceed the 5,500km range stipulated in the INF treaty anyway. Guaranteed that this is no secret that such system is being showcased. Simply because Club-T would be a system to pretty much counter US if they decide to break the INF treaty and having a ready to launch six Kalibr missiles with 2,000km would be the most ideal system to field. Creating a ground-based version of the sea-based complex "Caliber"
According to the Department of Information and Mass Communications of the Ministry of Defense of the Russian Federation, on February 5, 2019, a national conference was held at the National Defense Management Center of the Russian Federation under the leadership of the head of the military department Army General Sergei Shoigu. Starting work, the Minister of Defense recalled that from February 2, the United States of America suspended the fulfillment of its obligations under the Treaty on Medium and Shorter-Range Missiles. At the same time, the United States is actively working to create land-based missiles with a firing range of more than 500 km, beyond the limits of contractual restrictions, the head of the Russian Defense Ministry said. In this regard, the President of Russia has set the task of the Ministry of Defense to take retaliatory mirror measures. The General Staff presented to the Supreme Commander a list of the activities that he approved. The use of sea-based and air-launched missiles in ground-based performance will significantly reduce the time of production of new missile weapons and the volume of their financing. In addition, it is important to increase the firing range of the ground-based missile systems being developed today. “I instruct the Deputy Minister of Defense Krivoruchko to open the relevant development work within a short time frame within the framework of the allocations allocated for the state defense order for 2019 and the planned period 2020–2021 by redistributing funds for the implementation of these works,” the defense minister instructed. Source: Russia can create a ground-based complex "Caliber" by the end of the year. The interlocutor of the agency explained that the creation of a ground-based version of the complex does not take much time, since the long-range Caliber missile has long been in service with the Navy. MOSCOW, February 7. / TASS /. Russia can create a ground-based Caliber missile system and prepare its mass production by the end of 2019. This was reported TASS source in the rocket industry. "The ground-based Caliber missile system with a corresponding cruise missile can be created and prepared for mass production by the end of this year," the agency’s source said. He explained that the creation of a ground-based version of the complex does not take much time, since the long-range Caliber missile has long been in service with the Navy and, in particular, has been successfully used in striking terrorists in Syria. "To use this rocket in the ground version, you only need to make changes to its control system and replace the software," said the source. Earlier, Russian Defense Minister Sergei Shoigu said that the ground version of the Caliber complex with a long-range missile must be developed during 2019-2020. Would the calibr really be so effective in europe? I know thier air defences are pathetic but even those should be capable of stopping quite a few subsonic missiles. In combination with the new hypersonic semi ballistic missiles that detonate nuke warheads over their major airfields and comms centres and HQs, by the time the cruise missiles arrive their air power will be in tatters and certainly in no condition to look out for let alone stop these cruise missiles. subsonic low flying cruise missiles would be very effective against europe... and the US... how many drug planes penetrate the US's southern border? Russia does not have too many this missiles. Zirkona is still in testing. It takes several hundred such missiles. Iskander has only 500-700km range. Zirkon passed all the land tests, thats why they will test this spring from submarines and ships. The hypersonic intermediate-range missile acording to kommersant citing high-ranking sources in government will be a bigger Zirkon with intermediate-range. If they wanted Zirkon to BE the answear to the Americans they would just need a launcher and maybe some adjusts to the warhead or maybe not. Iskander has, 500km range with some changes in the electronic system it Will pass 1000km. Arrow wrote: Russia does not have too many this missiles. Zirkona is still in testing. It takes several hundred such missiles. Iskander has only 500-700km range. No they don't. That's why they will be buying more of them once testing is done. They do have loads of other missiles to use in concert with them. And then you have stuff that will be developed later. This is just a warm up. FYI, Kinzhal has 2000km range in default setup. Add another stage on it, put it on a truck and you are golden. With INF treaty gone they no longer need to waste 35 million bucks on a ship that can only carry 8 missiles. You can put those 8 missiles on 2 trucks that cost 100.000$ each. Thats 35 million that goes straight into purchasing missiles instead of ships with missiles costing extra. Washington shat the bed on this one big time. PapaDragon wrote: With INF treaty gone they no longer need to waste 35 million bucks on a ship that can only carry 8 missiles. You can put those 8 missiles on 2 trucks that cost 100.000$ each. It also means that Russian vessels defending the near abroad can be fitted with more AShM and less LACMs as standard. Not so important for Caspian forces who won't see any Monkey Empire combatants, but small vessels like Karakurts can now fully assume the role of ship-killers. They are always near the port so they can quickly go change their missiles if a country start being agressive toward them. It's not like US or japan or any other coubtry can build a huge naval force and send it attack russia without being noticed. Lonely ships will be dealt with air force. Land based cruise missiles are cheaper but not as easy to use as a sea based one. With a ship you can target any country you want. With ground based ones you can only target neighbours. Russia couldn't launch its kalibrs above Turkey to attack in syria. Ships allowed to solve this issue. Submarine launched are even better since you can go their unoticed and make a full surprise attack from the best possible position and strike much deaper. 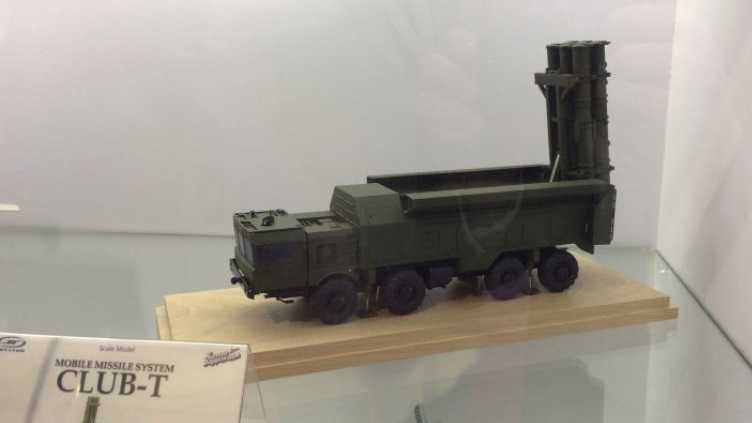 Of course not, the only missiles they currently have like that is the Kinzhal, which is basically an air launched Iskander with a range of 2,000km and a speed of mach 10... the weapons we are talking about could only be developed now that the INF treaty is suspended. Isos wrote: ...Land based cruise missiles are cheaper but not as easy to use as a sea based one. With a ship you can target any country you want. With ground based ones you can only target neighbours. Russia couldn't launch its kalibrs above Turkey to attack in syria. Ships allowed to solve this issue. Nuclear war aside Russia doesn't have any countries that it needs to target that are outside 2500km range, everything outside of that is inconsequential. With 4000km range on UKSK-2 it's just raw excess and entertainment. And they will always have some Buyans on standby for stuff like Syria where "angle" might be problematic. As for submarines it's irelevant if missile comes from land or sea, in both cases element of surprise is identical. With missiles with a range of 5.000km a unit in the northern ural mountains could shoot at ships in the med. Flooding urals and northern Russia with medium range missiles (and multi launchers, not 2 missile launchers) would make US think twice as those missiles would be within reach of lots of US assets. This trucks with four missiles are a good compromise between mobility and firepower. The flexibility of such a force will be immense. Look at the Kh-101, a Tu-95MS circling above the Urals can still hit any point in Europe but is out of reach of western fighters. Hole wrote: This trucks with four missiles are a good compromise between mobility and firepower. I think it was 6 missiles. Which needs to happen. A 6 missile launcher.